Shopping cart platforms completely transform your traditional website into a marketplace for your business, allowing customers to browse your products and services without ever having to set foot in your store. Shopping cart platforms completely transform your traditional website into a marketplace for your business, allowing customers to browse your products and services without ever having to set foot in your store. Essentially, shopping cart platforms are a virtual version of the cart you push through the supermarket. 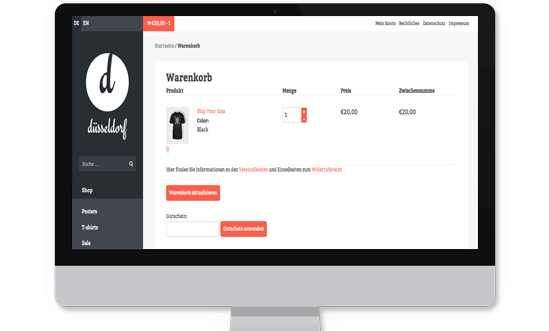 It allows you to add and purchase items on your website turning it into an ecommerce website. At ABC Marketing our preferred shopping cart platform is Woocommerce through Wordpress. Woocommerce offers a wide array of features including a fully customized look and feel to suit your business, social media integration and a plethora of extensions that allows us to do everything from putting additional options on your products to turning your ecommerce site into a membership website complete with recurring subscriptions. The main question you must ask when choosing to have us set up a shopping cart platform for you is what are the main goals for your business online? Take note of features you feel are a "must have" and the extra features you'd like to have but aren't deal breakers. There are many shopping cart platforms out there and ABC Marketing can help choose the right one for your business and get you selling your products and services online in no time!